Before bringing your animal to the shelter, please look into some other options for rehoming. We encourage all pet owners to use the animal shelter as a last resort when you are no longer able to care for your animals. YOU are Your Pet's Best Hope for a New Home! Believe it or not, you are your pet’s best option for finding a new home. Some people think shelters or rescue groups would be best for placing your pet because we have experience, facilities, screening guidelines, etc. However, an individual, particularly one who knows the animal, can focus all their efforts on that pet, provide the most information to prospective adopters and best determine the appropriateness of a new home. Also, shelters are stressful for animals. The shelter setting, no matter how nice, can bring on stress-related problems. Anxiety, aggression, and even illness are common, and these natural reactions may make adoption difficult or impossible. If you decide that you do need to re-home your pet, we want to help you become your pet’s best advocate for finding a home. PLEASE NOTE: These links navigate to third party websites, not controlled or maintained by Pitt County Government. We do not directly endorse this organization, and are not responsible for the content, views, and opinions provided on these pages. Rehoming your pet should be easy and stress free both for you and your pet. 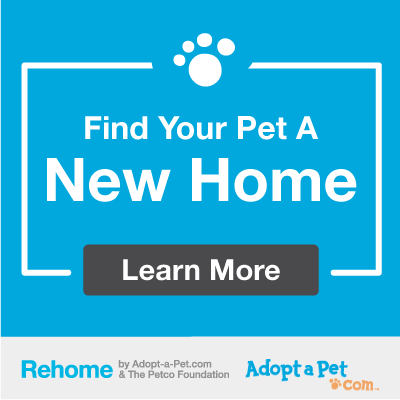 Experts at Adopt-a-Pet.com, the largest non-profit pet adoption website, with support from The Petco Foundation, have created a simple, reliable, free program to help you place your pet from your loving home directly to another. You don’t have to surrender your pet! Now, you can go to getyourpet.com, the website for rehoming a dog or cat without surrendering them to the shelter. Get Your Pet is an online community that directly connects people who need to give up a pet with people who want to adopt a pet. The process costs you nothing — just publish your pet’s profile and thousands of potential adopters will see it! If you have exhausted alternatives to relinquishment (Including trying to work through challenges, or trying to find a new home for your pet yourself with friends, neighbors, family or co-workers), please understand that we are a high volume open admission shelter. Pitt County Animal Services cannot accept every animal brought to our shelter immediately. We accept the surrender of owned cats and dogs by appointment only as space allows. There is a $20 surrender fee per animal, which is applied to the costs we incur providing care to the pet(s). At the time of surrender, due to our volume, we cannot promise you that your pet(s) will find a new home. Unfortunately due to high intake numbers, euthanasia is a possible outcome for any animal that comes to the shelter. Call between 8:00 am - 9:00 am Monday-Friday to see if there is a space for your pet(s) that day. If there is an opening you will be given a time that same afternoon to bring your pet(s) in. You will be required to complete surrender paperwork. North Carolina law requires the owner’s signature in order to relinquish the pet. The owner must bring in the pet themselves. At the time of surrender we will need a government issued identification card and proof of Pitt County Residency. The surrender fee of $20 (per animal) can be paid by cash, check or credit card. For everyone’s safety, all dogs must be leashed and all cats must be in a carrier.